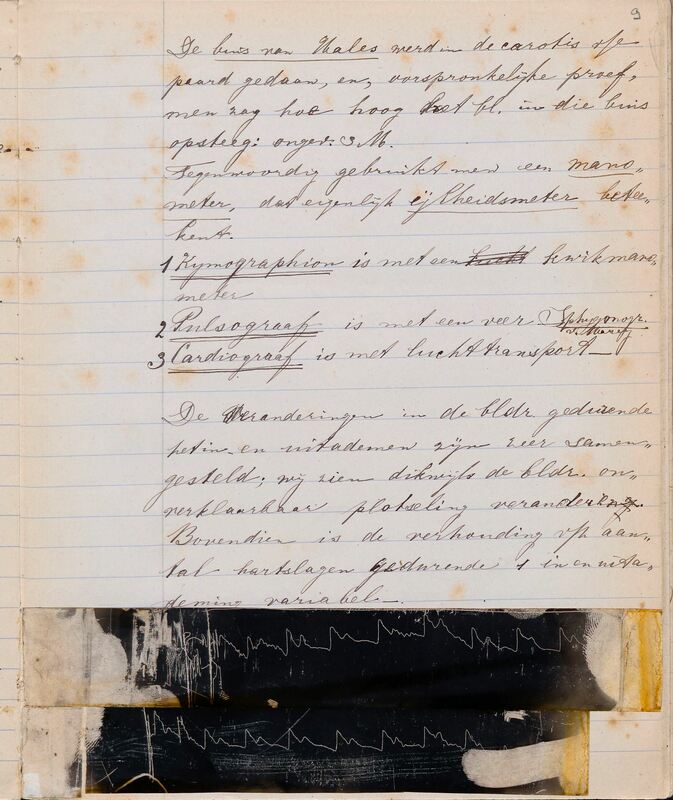 The student’s notes taken from the Physiology lectures of the Utrecht Professor Franciscus Cornelis Donders (1818–1889) is one of many such manuscripts in the collections of Leiden University Libraries. These specific notes are remarkable however, firstly because they were made in Utrecht rather than Leiden, and secondly because they were written down by the later Nobel laureate Willem Einthoven (1860–1927). Einthoven matriculated in 1878 as medical student in Utrecht and obtained his PhD there on 4 July 1885, during which time he worked closely together with Donders. From 1887 onwards Einthoven was Professor of Physiology and Cell Biology at Leiden. Einthoven was awarded the Nobel Prize for Physiology or Medicine in 1924 for inventing the string galvanometer, one of the first instruments which could detect and register the very feeble electric current produced by the human heart. This instrument can be seen as the first electrocardiograph with which so-called heart films (ECG’s) can be made. Such heart films made by the Einthoven string galvanometer are in the library of Museum Boerhaave (a 555 and a 606). The lecture notes reveal how Einthoven already experimented with detecting the human heartbeat during his study in Utrecht. To his lecture notes of Friday, October 21st 1881, he added two film strips, wrote on the back ‘my pulse registered with the pulsograph 29 Oct 81’, and signed them ‘W. Einthoven’.